The Original Building of the University of Texas Mental Sciences Institute, since demolished. Courtesy of M.D. Anderson Cancer Center. Image available on the Internet and included in accordance with Title 17 U.S.C. Section 107. 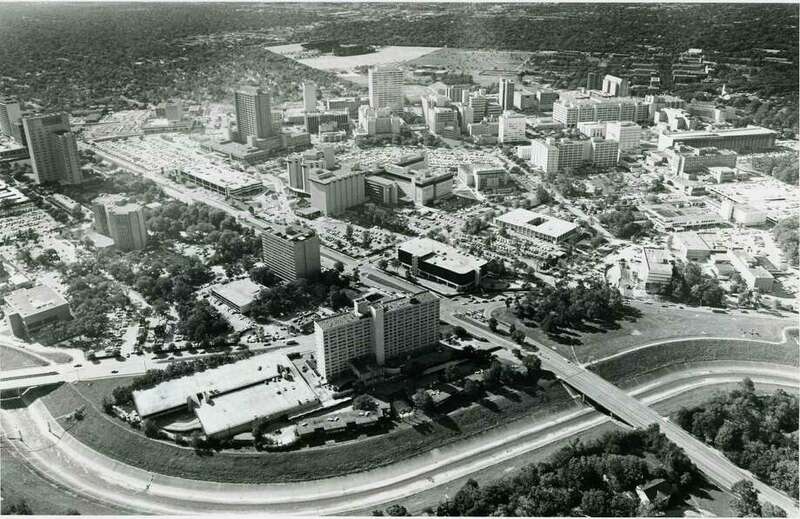 Texas Medical Center in 1980. Courtesy of the Houston Chronicle. Image available on the Internet and included in accordance with Title 17 U.S.C. Section 107. UNIVERSITY OF TEXAS MENTAL SCIENCES INSTITUTE. The institution now known as the University of Texas Mental Sciences Institute was originally established in 1955 as a pilot project by faculty of Baylor College of Medicine. The institute was funded in 1957 by the Fifty-fifth Legislature and named the Houston State Psychiatric Institute for Research and Training. It was placed under the administrative control of the Board for Texas Hospitals and Special Schools, with a mandate to act as the research and training arm of the state mental health and intellectually disability service system. The institute originally occupied a mansion on Baldwin Street in Houston that was on loan from M. D. Anderson Hospital. The first institute staff included two psychiatrists and five researchers, with research laboratories located in an adjacent carriage house. Dignitaries and staff attended the groundbreaking for a modern research and mental health care facility in the Texas Medical Center on July 10, 1959. It opened on February 3, 1961, complete with 70,000 square feet and a sixty-bed hospital unit. The hospital was relocated to a nearby facility in 1968, but the original building remains the home of the institute. William T. Lhamen served as the first director of the institute and John Kinross-Wright as the first associate director. At that time the institute was organized into four divisions: Biochemistry and Pharmacology, Bioelectronics, Psychology, and Clinical Services. Early institute research focused on measurement of biologic and psychologic variables reflecting the interests of Lhamen and Kinross-Wright. Subsequent research tended to reflect the changing priorities of the BTHSS and its successor, the Texas Department of Mental Health and Mental Retardation, and included studies in the fields of schizophrenia, gerontology, child development, substance abuse, and child psychology. Renamed Texas Research Institute for Mental Sciences in 1967, the institute assumed an increasing responsibility for providing treatment for mentally ill, intellectually disabled, and substance-abusing citizens. Baylor students and psychiatry residents rotated through TRIMS services until 1975. An independent psychiatric residency was established in 1977 and continued until 1985. The University of Texas Health Science Center at Houston Logo. Courtesy of UTHealth. Image available on the Internet and included in accordance with Title 17 U.S.C. Section 107. Portrait of Dr. Louis Faillace. Courtesy of UTHealth McGovern Medical School. Image available on the Internet and included in accordance with Title 17 U.S.C. Section 107. Twice the reputation of TRIMS and its research into mental illness and intellectually disabled was clouded, first by questions of CIA funding in 1975 and then in 1985 by a major scandal relating to the validity of research data. This latter problem contributed to the 1985 decision to reorganize the institute and transfer it to the University of Texas Health Science Center at Houston as the University of Texas Mental Sciences Institute. At that time the institute had primary responsibility for the care of 7,000 individuals and was the largest mental health clinic in the state. UTMSI was organized by Dr. Louis Faillace, acting dean of the University of Texas Medical School at Houston in 1985. The service role of the institute has decreased since that time, although research in neuropharmacology, neuropsychology, substance abuse, geropsychiatry, and child development continues. In addition, University of Texas medical students and psychiatry residents continue to receive training through UTMSI, as do psychology interns, social work, and nursing students. The Emissary (newsletter of the Texas Research Institute of Mental Sciences), June, July, August 1985. Houston Chronicle, July 18, 1975. Houston Post, March 17, 1985. Handbook of Texas Online, Dan L. Creson, "UNIVERSITY OF TEXAS MENTAL SCIENCES INSTITUTE," accessed April 22, 2019, http://www.tshaonline.org/handbook/online/articles/sbumk.